Only an artist at the top of their game can release an album without any prior promotion or ‘buzz’. Think Beyoncé last year. As of last week no one on this side of the fence was expecting a new Eric Church album. It was sent to his fan club members on the day of the CMA awards. The word on the street is that the album was recorded over a space of a month and the songs are either self written by Church or co written. Don’t be put off by the fact that this album has come out of nowhere. It showcases an artist who is certainly at the top of his game and I would certainly say it’s some of the best material he has produced. It’s been a very good year for music. We have had stunning albums from Chris Stapleton, Kip Moore and Don Henley and “Mr Misunderstood” will no doubt feature in many people’s top 5 this year. The title track, earmarked as the first single is almost autobiographical. Eric, as he explains himself, is “Mr Misunderstood”. The change of pace is very unusual for a country song. The rhythm builds then drops to a very slow drum beat before ending on a big finish. The song deals with those that don’t conform but rise above the crowd. “Hey there weird kid in your high top shoes sitting in the back of the class I was just like you”. “Mistress Named Music”, Eric’s tribute to southern rock, builds to rock guitars and a southern choir before ending acoustically. “Chattanooga Lucy” is essentially a soul/country dance tune. Is that possible? If Mr Timberlake is keen to venture into country music I would expect him be producing something like this. I can’t wait to hear this performed live. The mood turns mellow on “Mixed Dreams About Feelings”, a duet with Susan Tedeschi before we have the tour de force that is “Knives of New Orleans”, a standout and an absolute belter of a track. Surely a future classic. Eric has previously expressed his admiration for Bruce Springsteen. The Boss would have been very pleased to have this song in his repertoire. “Round Here Buzz” is a song made for country radio but this could be said for most of this album. “Kill A Word” maintains the quality nicely before we head to “Holding my Own” a mandolin dominated beach tune with a hook that hits the spot instantly. “Having a record year” has the feel of “Talladega” about it. It describes a rehabilitation from a break up and again would fit perfectly on country radio. The 10 track album ends with a track that is likely to be a favourite with many. “Three year old” is written about Church’s son and the lessons that can be learnt from someone so young and innocent. 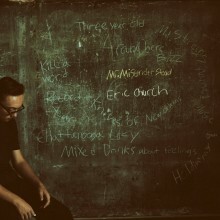 Eric Church is no stranger to our shores. He has headlined many a gig here and has a huge following. He is headlining C2C next March and I for one will relish the opportunity of hearing this album’s music showcased live. This is very well produced powerhouse album that will enhance Church’s formidable and growing reputation. Definitely one to check out.